Lenders now must notify residential tenants of landlords in foreclosure at three distinct points in the foreclosure process. The notice requirements help tenants, but they present several practical problems to lenders trying to comply with them. The Wisconsin Legislature has come to the aid of innocent tenants who are at risk of losing their residences in foreclosures because their landlords have defaulted on their loans. Wis. Stat. section 846.35 requires among other things that the lender provide notice to residential “tenants who are in possession of each rental unit”1 at three distinct points during the foreclosure process. First, the lender must provide notice that a foreclosure action has been filed no later than five days after filing.2 Second, the lender must provide notice that judgment has been entered no later than five days after the entry of judgment.3 Third, the lender must provide notice of the date of the confirmation hearing after the confirmation hearing has been scheduled.4 Each notice must be given by personal service or certified mail.5 A lender that fails to comply with the notice requirements is liable to each tenant for $250 in damages plus reasonable attorney fees.6 The award of damages and attorney fees appears to be mandatory even for a lender that has made a good-faith effort to comply.7 The notice requirements may be beneficial to tenants, but they present the lender with several practical problems. To provide the required notices, the lender must first be able to identify the tenants. With just five days after filing the foreclosure to give tenants the first notice,8 the lender will not have time to use traditional methods to identify tenants such as interrogatories9 or an appointed receiver.10 Although lending documents typically give lenders the right to obtain access to rent rolls, many lenders do not obtain updated rent rolls from landlords whose loans are in good standing. The lender may have difficulty securing the landlord’s cooperation once the landlord is in default. Even a cooperative landlord may not have accurate rent rolls that reflect subleases or informal rental arrangements. Lenders would be well advised to require frequent submission of accurate rent rolls from all landlords, including those in good standing. A lender that does not have current tenant information may need to conduct an investigation before filing the foreclosure action; however, the lender also must be aware that it does not own the mortgaged property and must respect landlord and tenant contractual relationships and rights. In some situations, the lender may not know that the property on which it is foreclosing is rental property. For instance, a single-family home or condominium unit subject to a conventional residential mortgage may not be occupied by the owner at the time of foreclosure. There is no exception to the notice requirements even when the loan documents do not contemplate or permit rentals. The lender will need to adopt a method of identifying the current occupants of property before commencing a foreclosure action to avoid this risk. Finally, the three occasions at which notice is required are spaced many months apart.11 Occupancy of rental units may change during the foreclosure process without the lender’s knowledge.12 The lender must accurately identify all tenants on three separate occasions during the foreclosure process. A cooperative landlord or court-appointed receiver may help with this process. Each required notice must be served by personal service or certified mail.13 The first notice must be served within five days of filing the foreclosure action.14 By way of comparison, the lender has 90 days to serve the landlord after filing the foreclosure action.15 A lender may be hard pressed to identify, find, and personally serve each tenant in this short time frame, especially in foreclosure actions on multi-unit or multiple properties. A lender may simply be unable to serve tenants who have unpredictable work schedules, are on vacation during the notice periods, or are evading service. Norman D. Farnam, Illinois 1999, is a member of Stroud, Willink & Howard LLC, Madison, practicing in business and commercial litigation, including assisting lender clients with foreclosures, debt restructuring, and commercial loan work outs. John J. Laubmeier, U.W. 2005, is an associate with the firm, practicing in business and commercial litigation. 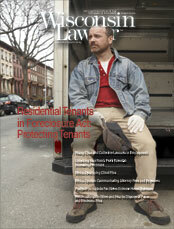 Personal service on tenants also will increase the cost of foreclosure actions. Private civil service can range from $35 to $75 per service. To fulfill all three notice requirements, the lender may need to incur this service cost three times for each tenant, including separate service charges for each tenant in a single rental unit. In many cases, the lender will be unable to recover these expenses from the insolvent landlord. Certified mail may be used as an alternative to personal service.16 However, service by certified mail often will not be a viable option. First, a lender cannot use certified mail if the tenant’s identity is unknown.17 Second, service by certified mail is not complete if the letter is returned to the lender unopened.18 If a tenant refuses to sign for the letter, or fails to go to the post office to retrieve the letter, it will be returned to the lender unopened. It almost certainly will take more than five days for the U.S. Postal Service to return the unopened letter, thus leaving the lender no time to correct the defective service and resulting in a violation of the notice requirement. The notice requirements are clearly intended to give fair notice to tenants that they may lose their residences. Usually, however, the lender wants to keep the tenants. There is no exception to the notice requirements for tenants who will not be asked to move. Tenants may be confused or frustrated when they repeatedly are served with notices of the foreclosure proceeding: recall that each tenant will be served as many as three times, perhaps by personal service. Tenants might assume that they will need to move out, when in fact they do not. Some tenants may take advantage of the situation and stop paying rent, knowing that the finically distressed landlord is not likely to evict them during a foreclosure. Likewise, during the foreclosure process, the landlord has the opportunity to redeem or sell the property or enter into a loan work-out agreement with the lender. Many landlords view the notices as harmful to their relationship with their tenants and as interfering with their efforts to resolve the foreclosure problem. Lenders that do not wish to terminate leases or that are working with the landlord to resolve the loan default should take care to craft a notice to tenants that conveys the appropriate message. The federal government recently enacted the Protecting Tenants at Foreclosure Act.19 This federal law provides for additional tenant protections in foreclosure actions and contains an additional tenant-notice requirement. A lender that is seeking to terminate residential leases through foreclosure should recognize that compliance with Wisconsin law may not satisfy the federal law. The lender should carefully review the federal law to determine if lease termination is permissible and to comply with the additional notice requirement. While the notice requirements of section 846.35 are doubtlessly well-intentioned, they may create many unintended practical problems for lenders. Attorneys for lenders should consider how the notice requirements will affect the foreclosure process and implement procedures with their clients to ensure compliance. 6Wis. Stat. § 846.35(1)(c). A tenant may not recover under this paragraph for more than one notice violation. 7Wis. Stat. section 846.35(1(c) uses the word “shall” with respect to the award of damages and attorney fees to a tenant who does not receive a required notice. 11The typical redemption period for nonowner-occupied rental property will be three months in a situation in which deficiency is waived or six months in a situation in which deficiency is not waived. See Wis. Stat. § 846.103(1), (2). 12Newly enacted Wis. Stat. section 704.35 requires that landlords provide new tenants with notice that the property is in foreclosure when the lease is executed. However, the statute does not require that the landlord provide notice to the lender that new tenants have moved in. 17See 39 C.F.R § 211.12(a)(2); USPS Domestic Mail Manual § 602, ¶3.1.2(b), § 503, ¶3.3.5(a). § 702, 123 Stat. 1632. This federal law is set to expire on Dec. 31, 2012.